Why Is This Misogynistic 'Good Mother' Meme Still in Circulation? Why Is This Misogynistic “Good Mother” Meme Still in Circulation? The internet is filled with morale-boosting memes for moms, folksy platitudes of the sort that were once limited to magnets and faux-antiqued wooden plaques sold at novelty stores and rest stops. Many of these are banal meditations on sleeplessness or a lack of free time. “I don’t need a fancy vacation. I’d be happy with a trip to the bathroom by myself,” reads one. “Woohoo, it’s Friday! Oh wait, I’m a mom,” reads another. Others are not so benign. Among these are a subcategory of reflections on how inept—and hilarious!—dads are, as well as another focused on redeeming mothers from whatever, usually patriarchally informed, parenting peccadillo they believe themselves to have committed. This meme has been around for a while now, and, despite the fact that it contains a dusty moral logic that would be more at home in the pre-Second Wave era, it endures. Before I carry on explaining why it’s terrible, I should clarify that I am not completely immune to its appeal. Somewhere in there is the message that human connection is more important than material appearance, and making more time for the former can often lead to less time for the latter. Great! Unfortunately, that sentiment is sitting under layers and layers of misogynistic and classist garbage that really should be taken out. Other issues with this meme: It implies that the domestic realm, including housekeeping and child-rearing, is exclusively the domain of the mother. Recent horror stories shared on social media about the dark side of Mother’s Day, many accompanied by #mothersdayfail, reveal how persistent this idea is. Moms report being gifted with a day of leisure, only to have to do the laundry and dishes themselves once night fell. Other problems? It gives women two options for their time—kids or cleaning—neither of which involve doing something for herself. Also, it doesn’t do anything to abolish the semiotics of tidiness as a system through which women should evaluate one another. Better than saying when a less than perfect house is and isn’t OK is to stop talking about the state of houses at all. 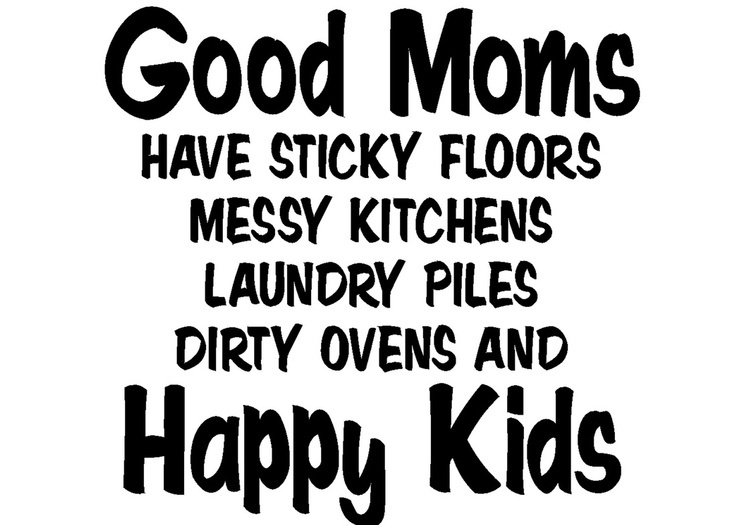 Finally, some moms like a clean house. I like a clean house. This does not speak to my fitness as a mother. These memes are part of a larger online mom culture filled with seemingly innocuous, but ultimately insidious, attempts to make one another feel better. What would work better than sharing barely subversive definitions of “good moms” is to stop trying to define “good mom” altogether. Doing that would save all the busy, exhausted moms out there, including those too overwhelmed to clean, even more time.